Aaaaah… I love me some good customer service. Neo is the kind of place where the owner offers to fix the wobbly table for you before you even ask. Or has spare laptop chargers on hand, practically encouraging you to hang out and work for awhile rather than glaring at you and chasing you away after you finish the last sip of your drink. It’s new and it doesn’t have much on the menu, but the nice atmosphere, great coffee, and welcoming atmosphere really set this place apart. The owner (manager?) is a Rwandan guy who’s spent a bunch of time living in Toronto and has created space that has the feel of a North American style cafe. It’s slick, there’s a nice logo, good music, and it’s very laid back. The ham and cheese sandwich is quite good and at Rwf 1,500 I think it’s a great bargain. I’m not sure the ham is actual ham… I think it’s more likely mystery meat (coldcut style) but I prefer that stuff so I was happy. The bread is what makes the sandwich, though. 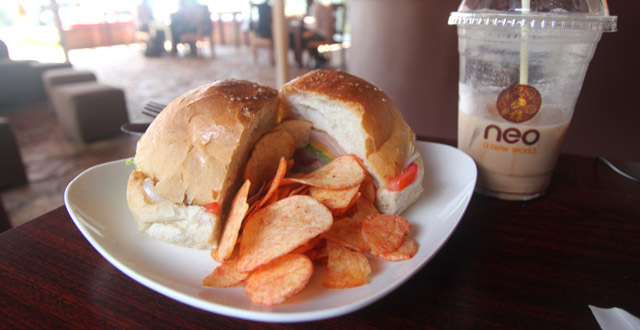 Most places in Kigali serve their sandwiches on dense rolls, but Neo’s offering is on a soft bun with sesame seeds and everything! It’s a damn fine sandwich. Plus it comes with a healthy serving of chips. Given their reddish tinge and the owner’s Canadian connection I was sure they were ketchup chips (something only a Canadian will truly appreciate) but, alas, they were not. Still tasty though. I guess the only issue I have with the food here is that your only choice is a ham and cheese sandwich, a chicken sandwich, or a veggie wrap consisting of carrot, lettuce, and avocado. Plus plain chapati, samosas, and banana bread. While the sandwich I had was good… I think there’s a bit of a missed opportunity here. I’m pretty sure the focus is coffee and that’s great but I think a lot of people like their coffee with a sweet snack and I’d love to eventually see a bit more choice in the desserts department. I’d like to recommend chocolate cake. Or brownies. Or cookies that aren’t rock hard a la other Kigali cafes. Or since there’s a Canadian connection how about some butter tarts or Nanaimo bars? I can dream, can’t I? 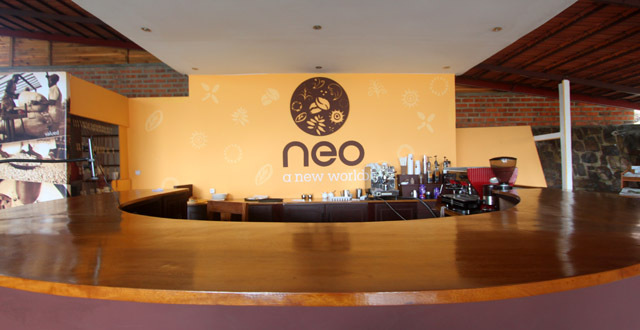 I’m not a coffee expert by any stretch of the imagination (I like the coffee I buy at Nakumatt and I’m not even that offended by Nescafe) but I’m told that the aim of Neo is to provide the best coffee in the city. From what I’ve tasted so far, they make a mean cup of coffee. 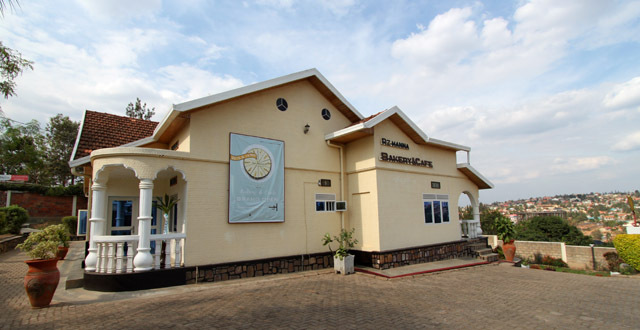 I’m told that most of the best Rwandan coffee is exported but this place gets its share before it leaves the country and serves it up to what seems to be a loyal following. I’m particularly fond of their African coffee but it’s very gingery, so be warned. I love me some ginger. The plastic cups with the logo are pretty flashy but I’m not sure why I keep getting served plastic when I’m not intending on taking it anywhere. It’s nice to see that ‘to go’ cups are available but I’d like to see them start to use glass cups for people drinking their icey coffees at Neo. You know… that whole environment thing. Since my last visit a couple of months ago, Neo has added a sign on the street so people can find the place. Yay! You’ll notice the sign just across the road from Great Wall and next to Top Tower Hotel. Walk down the driveway and, behold! There it be. It’s kind of a cool setup with open air on three sides and a nice view into the valley below. It’s right next to a new tech incubator called Think and uses their wifi, so it’s fast. It looks like the wifi is limited to an hour at a time but I can’t imagine they’d be too strict about this, especially if you keep the coffee coming. The prices are pretty reasonable with an iced mocha coming in at about Rwf 500 cheaper than Bourbon. Better, too. Service is quick, friendly, and professional. They even have a couple of fancy coffee-dripper gizmos to try out. 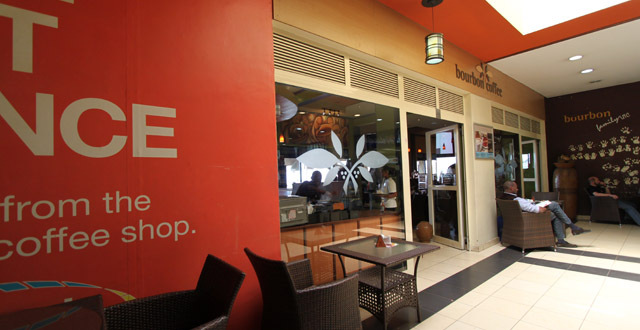 If you’re a coffee lover then this is your place! 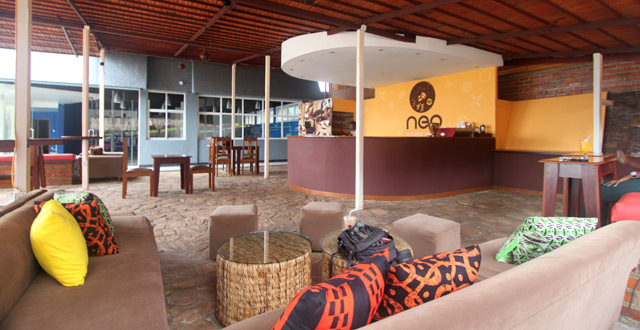 It is an awesome place to hang out.. Che’ and his gang are great and it the best coffee in Kigali.. by far! I think the word you’re looking for is ‘snarky’, though I’m not so sure what the issue is in this article. I love Rwanda and if you read through this website I think you’ll see that fact come through quite obviously. Again, I’m not exactly sure what your specific issue with this article is (or if you just woke up in a bad mood and felt like rudely raging on the internet), but I refuse to hold back on warranted criticism because I happen to be in Rwanda. I find it condescending and just as offensive as the ‘it ain’t like this in America!’ attitude. If you read through my articles you’ll find that I tell it like it is and attempt to put a positive spin on things. If you find complaining about a super hard and dense hamburger bun somehow offensive to Rwandan culture, I don’t know what to say to that. The ‘if you don’t like it, go home’ attitude is simplistic and naive, but I’ll take a page from your book and invite you not to read the website if you don’t like what you find here. There are plenty of people who really love this site and I’ll keep writing honest articles for them.